A Fulton County Sheriffs Department captain who was fired in the aftermath of the courthouse shootings was allowed to retire with clean record under a confidential agreement reached with Sheriff Myron Freeman. Capt. Chelisa Lee was reinstated Nov. 10 and immediately retired, according to the agreement, which was made final Thursday. In exchange for the county’s agreement to erase the termination from her record. Lee agreed not to sue the county for firing her, according to the four-page agreement. 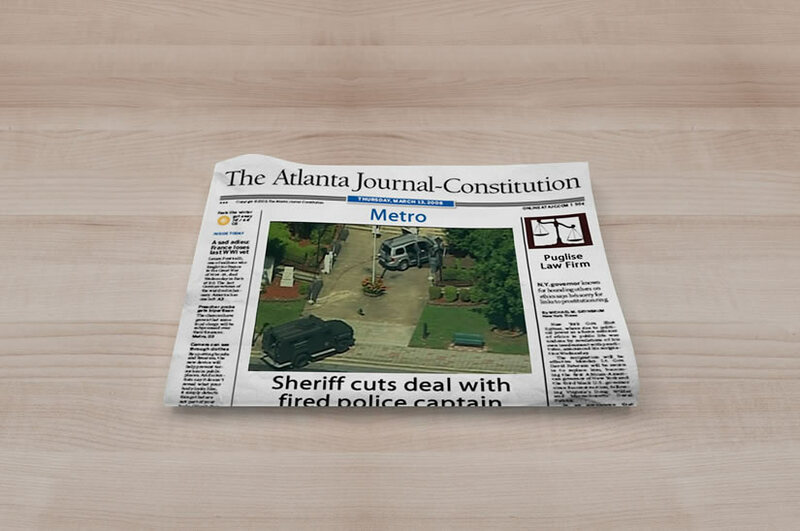 A copy of the document was obtained by TV station WSB and provided to the Atlanta Journal Constitution. The terms of the deal require both Lee and the county to keep the terms confidential. Even though the terms were negotiated by Fulton County attorney O.V. Brantiey, Commission Chairwoman Karen Handel said the COunty Commission had not been informed about it. Handel also expressed concern that Lee’s record would not indicate to a future employer that she had been fired by the county. “Heaven forbid if something should happen in the new job. “she said it is unclear what the deal means for Lee’s salary, benefits and pension. The agreement doesn’t doesn’t address such issues. Nevertheless, Handel said she understood that Lee would receive some back pay and would retain some retirement benefits. Neither the Sheriff’s Department nor Lee’s attorney Mike Puglise, would comment on the details of the agreement “it was a good resolution for both parties [Fulton County and Lee],” Puglise said. The spokeswoman for Freeman declined to comment on the agreement referring all calls to Brantley, who could not be reached for comment Thursday evening. Lee was among eight deputies, including two majors, initially fires because of their actions of failings in the days leading up to and the morning of the March 11 shootings. Lee was appealing her dismissal when the agreement was reached. An 18-year department veteran Lee was accused of failing to assign additional security to Brian Nichols, who is accused of escaping his Sheriff’s Department guard and going on a shooting spree that left four people dead. Lee also was faulted for sending a subordinate to get breakfast when he was supposed to be monitoring the courthouse from a control room. She also was accused of lying to investigators and failing to pass along information about the discovery of metal in Nichols shoes two days before the shooting, which was an indication that Nichols needed special attention. Puglise, Lee’s attorney said Lee’s plans are to put her life back together : As far as her career she hasn’t decided,” he said. Lee is among the Sheriffs Department officials named in a wrongful death lawsuit filed by the widow of a Fulton county judge fatally shot in his courtroom on March 11. The suit accuses Lee and others of violating departmental policies and failing to protect Superior Court Judge Rowland Barnes. Nichols remains in jail awaiting his death penalty trial and has pleaded not guilty to charges he murdered Barnes, court reporter Julie Ann Brandau Deputy Hoyt Teasley and U.S. Customs agent David Wilhelm. In addition to faulting Lee’s actions the morning of the shooting, the suit accuses Lee and other department officials of failing to investigate an incident in which metal devices were found on Nichol two days before the shootings.